Black Friday is just around the corner, which means so is Record Store Day. 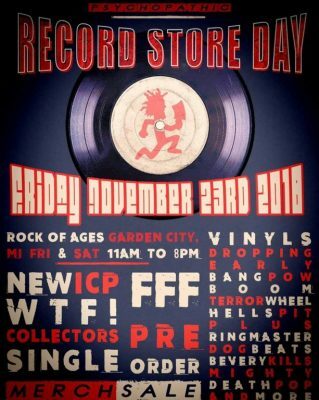 On November 23rd, Psychopathic Records will be setting up shop at Rock of Ages in Garden City, Michigan. There will be various exclusive Insane Clown Posse releases, including Bang! Pow! Boom!, The Wraith: Hell’s Pit, Mighty Death Pop!, and The Ringmaster. Also, as a bit of a surprise, the EPs Dog Beats, The Terror Wheel, and Beverly Kills 50187 will be released as well. In addition, an exclusive collector’s edition of “W.T.F. !” (the upcoming single from Fearless Fred Fury) will be released as well. You can also pre-order the actual album while visiting too. Although this extravaganza is confined to just the Rock of Ages store, in specific outlets, The Amazing Jeckel Brothers will be reissued on vinyl nationally. You can peep the official Record Store Day website HERE. Sweet! now where’s the mne post about exclusive record store release deals? I swear, I’ve never seen you post anything remotely positive or constructive. You must be on your period 24/7.